Happy Mother’s Day to all….. viewing some great moms in hosted bird cams! Happy Mother’s Day… to all the great Moms out there! From the winged to the walking and everything in between, bird cams capture the miracle of life, and the harshness of Mother Nature as well. Two interesting live streams of hosted Bird Cams from The Cornell Lab of Ornithology and New York Sate Bluebird Society are listed below. From The Cornell Lab of Ornithology: Live Red-tailed Hawk Nest. There’s also a cam for a Great Blue Heron Nest on their website. Recently a post on a Bluebird List-Serve mentioned an attack by Tree Swallows which was captured on the cam… I don’t have the heart to watch though. The actual date of attack is May 5, 2012. Here’s a link for the brave of heart. Because of recent pricing decreases (amazing huh?) 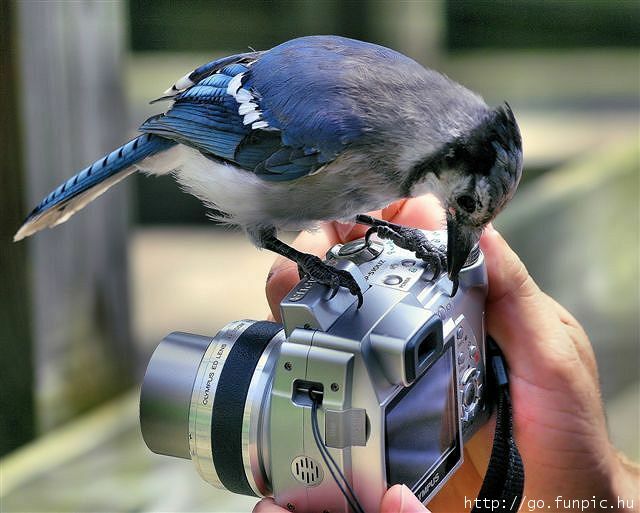 bird cams are available to the masses at very reasonable prices. The newest one is a Time-Lapse Cam from Wingscapes which sells for around $100 to $110. A one-time investment for the camera will bring hours, days, weeks, months and even years of glimpses into some of nature’s tiniest miracles. A fantastic educational tool for young and old alike, Bird Cams promise to bring joy and a touch of wonder to the viewer! In the “Bluebird Monitor’s Forum, there recently appeared an interesting post about bird cam installation and viewing capabilities/preferences. The “away-signature” cracked me up.. because I can so relate, and likely many other folks out there in cyber-world. It said “Using yesterday’s software to create tomorrow’s problems today!” Hah… isn’t it the truth with the ever-changing technology? “I acted upon the recommendation of the Hawk Eye Night Owl Bird Cam and installed one in a new and taller chickadee box which hangs in our front yard. A Black Capped Chickadee scolds me every time I get near the box. 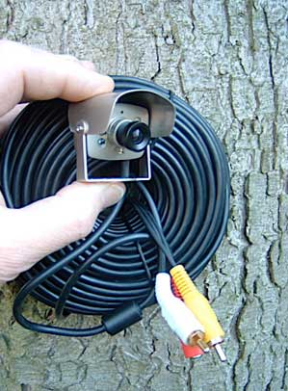 The bird cams 100′ long cable was then strung into the garage, where I asked myself what next? The camera’s composite video could be plugged directly into a number different devices permitting viewing/recording, but this is the age of the internet–I wanted to view/record the video from my computer. Since I already had a Ethernet hub in my garage which is connected to my LAN, I wanted a use an affordable video server plugged into this hub. The answer was solved by purchasing an IP Video 9100A Plus Network Video Server. Basically the camera’s video and sound plug into the 9100A, and it plugs into the Ethernet hub. Once all is connected and setup, the camera’s video can be viewed/recorded from your web browser (preferably Internet Explorer). The sever can be setup to detect motion, and when motion is detected, send an e-mail, and/or FTP images to a server. The server could actually be set up to permit viewing anywhere in the world. The 9100A actually has 4 video inputs, but only 1 sound input (hmmmm?). I’ll not go into further detail unless asked, but I would advise anyone purchasing the device to be skeptical of the quick setup instructions that come with the device. The installation manual was not written/edited by someone whose primary language is English. Knowledge of IP devices helps. not about bird cams… something better! 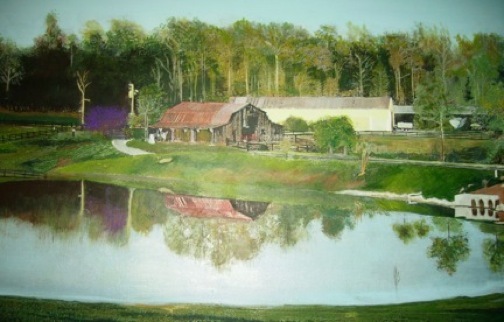 Here’s a picture (actually a painting I did several years ago) of the back 40 of the equestrian center where I work part-time. It’s situated on 400 acres, about one hour northwest of Atlanta. As you can very well imagine, it’s prime wildlife habitat. We have some good-and not so good inhabitants. The latter is being inundated with house sparrows, and several coyotes driven there by development. This blog was supposed to be on bird cams, and I sure do wish we had a few of them scattered around the place! Today there was an amazing occurrence and I missed it, missed it I tell ya… a once in a lifetime opportunity! A boarder was grazing her horse near this very pond earlier today. She in fact phoned me on the way home to tell me what had happened. 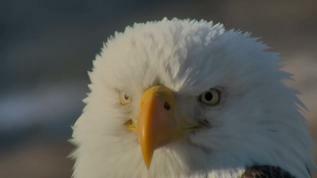 By the tone in her voice I could tell it was something out of the ordinary… “a Bald Eagle” she said. 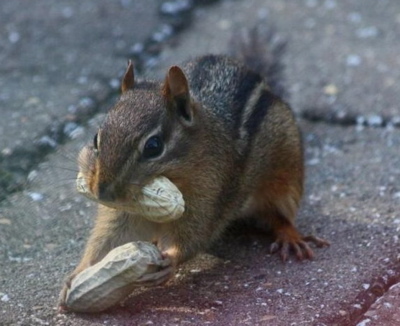 It had been spotted stealing eggs from a nest. “Huge” she said, with a wingspan wider than the length of her horse. She said the bright white head was unmistakable, and it must have been raiding a crow’s nest as several were trying to dive-bomb and chase him away, still carefully keeping a distance. We can only hope this Bald Eagle thinks the diggs are pretty decent around here, and decides to take up permanent residence at Moonlight Stables. Sorry there’s no photo… we’ll definitely be on the look-out though! Gone are the days of cumbersome and huge electronics. Innovations in just about every industry seem to move at the speed of sound themselves, and backyard birding is no exception. Bird Cams with crystal clear resolution are widely available, and have even come down to a reasonable price, making them affordable to most hobbyists. Some birdhouses are already equipped with bird cams, which makes the set-up process that much easier. The bird cameras are so tiny, they don’t hinder the nesting process at all. Imagine viewing live images of hatching chicks, and watching their progress on a daily basis? For children, this has got to be the one of best experiences of mother-nature – up close and very personal. 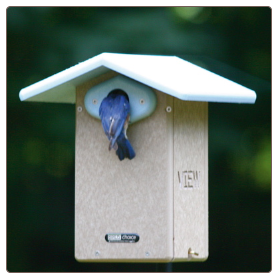 The recycled plastic Bluebird house shown above features a built-in bird cam, plus additional features that make this residence superior…I want one! Bird food, houses and birdbaths, we set them up in hopes of attracting feathered friends to our yards. We start watching and begin to notice much more about birds. Hoping to catch a glimpse of a new species every now and then, we simply “bird watch” and are taken away to another realm. 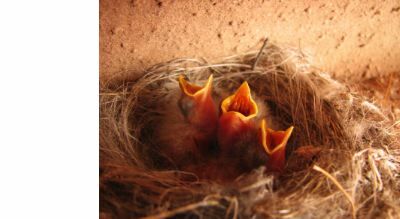 With the introduction of bird cams, we can catch so much more about bird’s nesting behavior and raising their young. It’s almost like a secret window into another world. The quality is superb, and allthough the price of bird cams has come down substantially, it’s still a pretty hefty investment for some. Thanks to the Cornell Lab of Ornithology, there’s a terrific site for viewing multitudes of bird cams in one place. The Nest Cams Project site offers viewers a drop-down menu of specific birds and their nesting process. They do ask for a donation to keep this site up and running, but for most choices on the menu you can scroll down to see some great video highlights. Definitely worth checking out! The birds around here are fed daily; the meal worms, the woodpecker mix, the bark butter, the cardinal seed, hummingbird nectar, sunflower hearts, finch mix and thistle seed, drippers and misters, and oh yeah, the squirrels too. This is part of my morning ritual, checking feeders and cleaning bird baths if necessary. Some folks think I’m crazy, but it’s so worth seeing an adult bluebird feeding fledlings mealworms from the bluebird feeder. Mornings seem to be so rushed too, I barely catch a glance here and there of the fabulous activity right outside the kitchen window. So, I’ve devised a new plan, that when I get home and grab some coffee, it’s straight outside to the back deck. Time to sit down and watch the birds who I so routinely feed every single day. Just tonight, it was amazing to see all the species and the cutest babies just learning to use the feeders. Bluebirds, Cardinals, Goldfinches, Titmice, Nuthatches, butterflies, both Hairy and Downy Woodpeckers, Purple Finches, and Hummingbirds buzzing my head as I was too close to their feeder. It was like a show. My next plan is a bird cam to catch all this action while I’m gone most of the day. Bird Cams are like nature’s spies, and I want one! Recording much more than the birds, they should call it a Wildlife Cam. They don’t have to be installed in a birdhouse, just set near some busy feeders and they’ll record tons of activity for later viewing. A great show like this shouldn’t be missed! Check out this awesome video of an Allen’s Hummingbird Nest. This person has captured some wonderful activity of hummingbird birth with a bird watching camera. Check out this great bird cam capturing an Eastern Bluebird feeding nestlings and removal of sacs. Buying a bird cam is much more feasible now as more models are available and prices have dropped considerably. They’re a great educational tool, as well as just plain entertaining to watch. Bring the great outdoors into the living room with a bird watching camera and witness some of nature’s little miracles!